The TVS Ntorq 125 is the two in the one-two punch combo that TVS Motor Company has landed for 2018 - the Apache RR 310 being the one. The TVS Ntorq 125 sits smack in the middle of the 125cc scooter segment, which is touted to have a strong growth potential in a market so far dominated by 110cc offerings. Honda and Aprilia have laid down their cards, while the Suzuki Access 125 continues to lead the pack. With the Ntorq 125, TVS looks to bring its signature blend of performance and accessibility with a twist of connectivity. Is this enough for a knockout? Let's find out. The Ntorq 125 has a sharp design with a front heavy visual bias. The front fascia on the Ntorq looks sporty with its sharp creases which will work for the youth, but the styling is restrained enough to have wider appeal. The front apron houses a large halogen headlamp with a bright LED DRL strip making up the chin under it. We would have appreciated it if the headlamp too would have been a LED unit. The panels to either side of the apron are matte grey and have large 125 lettering with some graphics in the background. Turn indicators are neatly integrated into the instrumentation cowl, and at enough height to be amply visible than would be if placed on the sides of the apron. The side body panels taper sharply towards the rear to make this scooter appear lighter and smaller grey panels near where the feet will be placed keep the bright bodywork from gathering scuffs. That said, the bright matte body colour options will require very regular cleaning to keep looking their best. The Ntorq features split rear grab rails. The Ntorq features black diamond-cut 12-inch alloy wheels shod with 100/80 front and 110/80 rear TVS tyres. The tyres have a wider profile than the competition and give the Ntorq a more performance-focused look. The best part of the Ntorq design is the rear, where the T-shaped LED tail lamp is complemented by afterburner style faux vents, which look like twin exhausts on a sporty motorcycle. The actual exhaust is a chunky unit mounted to the right side. On the features front, the Ntorq sports an engine killswitch, as well as a low-high pass switch. The killswitch means you don't have to turn the key if you want to switch off the scooter at, say, a long traffic signal. Underseat storage is ample at 22 litres. Still not enough for my full-size helmet but it will fit most Indian-make helmets which have smaller shells. TVS has also included a USB charging port as well as small storage area lamp to help you find little knick-knacks. The overall finish, as well as quality of plastics, is good. The Ntorq 125 features a stylish digital LCD display with SmartXonnect. At its centre is a large speedometer, with a trip meter, odometer, and clock above. Telltales include turn indicators, eco/power mode indicator, and high beam. On the bottom row are the fuel gauge to the right and an oil temperature gauge on the left. The central part of the display here is where all the fun lies. Pressing on the Mode button below the display switches between street and sport modes. In the latter, the odometer switches to a lap timer. You can also access your ride stats, lap times, and top speed here - not that any of these stats will come in handy in daily use. Keep the Mode pressed for about 5 seconds and you can pair the Ntorq to your Android smartphone via a custom app. Using the app, you receive incoming call and message alerts, access turn-by-turn navigation, and even send an automated reply to all incoming calls. The display's position means you will have to look down from the road to see any of the alerts, which may not be the safest thing to do while riding, but it is certainly a good system that eliminates the need to check your phone at every traffic junction. With the app, you can also locate your scooter's last parked position, so hunting down your scooter in a mall parking will be easy. This works by saving the location at the time of parking, but the accuracy may vary as the GPS location is based on your mobile device, and a majority of such parking spots are in basements. The 124.79cc air-cooled single cylinder CVTi-Revv engine has a three-valve layout. This means there are two intake valves and an one for exhaust, similar to that seen on TVS motorcycles. This layout gives the engine a good blend of torque and efficiency, claims TVS. The engine produces 9.4PS at 7,500rpm and 10.5Nm at 5,500rpm. This power is transmitted via a CVT that has been re-geared to better handle the increased torque compared to smaller 110cc offerings from the company. The Ntorq carries its high 116kg kerb weight from standstill to 60kmph in 8.7seconds. 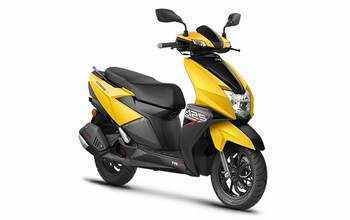 That lands the Ntorq behind its main competitors, the Honda Grazia and Suzuki Access 125 in outright acceleration. The Grazia and Access 125 had recorded 0 to 60kmph times of 8.4s and 7.9s, respectively. The Ntorq does not feel slow, however. Its power delivery feels linear all the way to a claimed top whack of 95kmph. The refinement on the engine especially shines when rolling from low 20kmph speeds to 60kmph for that quick overtake. Refinement, on the whole, is worth noting, with noticeable vibrations only seeping in through the foot board at speeds around 85-90kmph. There are small bar-end weights which seems to work well in keeping the vibes away from the rider's hands. The chunky exhaust muffler certainly does its job well, giving out a deep note that - dare I say it - is quite motorcycle-like. This will certainly appeal to younger riders. In terms of fuel efficiency, the Ntorq delivers 50.2kmpl in the city and 60kmpl on the highway. The seating position on the Ntorq is neutral and very comfortable. The seat feels a little softer than that on the Grazia. For this 5 foot 10 reviewer, the handles did not graze my knees even when making a tight turn. However, the footboard width could have been slightly more, considering that if a small backpack or packet is placed here, there is very little space for the rider's feet. That said, sporty scooters do tend to have narrower footboards for a more streamlined shape. Unlike all other offerings in the segment that have hand-me-up underpinnings from their 110cc siblings, TVS has gone with a completely new rectangular profile underbone on the Ntorq. This adds more stiffness to the chassis, resulting in a more confident ride. Its wheelbase measures 1,285mm, at least 20mm longer than its direct competitors from Honda and Suzuki. Despite this and the weight, the Ntorq handles sharply. It is very flickable and seems easy to tip into corners, making it fun to ride through traffic snarls too. In fact, the added heft lends the Ntorq a surefootedness at speeds exceeding 80kmph, which is confidence-inspiring. The suspension setup with a telescopic front and hydraulic rear shock is firm, yet pliant. It absorbs a majority of potholes and undulations. It also doesn't thud over big potholes as harshly as some other scooters. The Ntorq has a 220mm front disc, which is 30mm larger than the Access 125 and Grazia's, and 130mm rear drum brake setup. This results in a braking time of 2.8s to come to a standstill from 60kmph. There is enough feedback through the levers as well. The brakes only lead to tyre squeals at the very end of a pull-in, which means there are no surprises to be had in case of sudden braking. The tyres help here providing a fair amount of grip in all urban scenarios. The Ntorq 125 is a good scooter and veers well towards the TVS way of bringing out machines that offer ample but not extreme performance, a la the Apache RR 310. Performance, especially in terms of outright acceleration is a little lacking but this scooter makes up for that with its refinement, which will also find appeal among more than just the youth. Whether this is enough to trounce the current leader Suzuki Access 125 remains to be seen. The lack of an LED headlamp as well as its high kerb weight are issues for the Ntorq. But neither gets in the way of comfort or convenience. At Rs 58,750 (ex-showroom, Delhi) it is priced just Rs400 more than the Access 125. For that price, there is a lot of standard kit on it including those gorgeous black alloy wheels and the SmartXonnect connectivity system. Its styling is sporty enough to find appeal amongst the youth, yet not extreme enough to be limited to just them. TVS, then, appears to have found a great balance with the Ntorq 125. ActivaBatteryPrice is using Hatena Blog. Would you like to try it too?